It wasn’t too long ago when OR was a new player in the world of heated gloves but now they’re a bonafide leader in the industry and it’s no surprise at all. These Outdoor Research Stormtracker heated gloves are one of 4 pairs of heated gloves that they make (as I’m writing this) and I’m excited to write this review because as you all know, I’m obsessed with OR. You can get an idea just how obsessed I am with OR simply by reading my reviews of the Flurry and the Lucent which continues to be one of my top picks. The Stormtracker is made with OR’s Alti heat technology which delivers heat safely and evenly throughout the hand which is great. So many heated gloves out there only distribute heat to one area or have hot and cold spots which is less comfortable. As expected these gloves performed really well so let’s get into the details of the gloves to see just how well they did. Here’s a quick video explaining OR’s line of heated gloves. The shell is made of nylon, spandex and goat leather so you can expect a little bit of stretch and really good flexibility. The interior is made of polyester but it feels soft and fleecy so it’s really comfortable to wear for long periods of time. Once I put them on I was content to leave them on all day without concern. The insulation is noticeable but not too bulky so you still have good mobility and dexterity which is key in my mind. Sure you won’t be using your touchscreen device with them on but using zippers and buttons is no problem at all. Since there’s electric heat they’re able to reduce the amount of insulation which makes for better dexterity and mobility and to me that means comfort. I thought they were really comfortable especially considering how warm they are. That brings me to warmth. These glove are one of the warmest pairs I’ve ever tried. The heat truly does surround your entire hand and it would take some very extreme weather to make your hands cold while wearing these. There are 3 heat settings and even the lowest setting was pretty good. I would say that you only need the highest setting if the temperature dips down to -4 Fahrenheit (-20 Celcius) or colder. Anything warmer than that you’ll only need the two lower settings. For comfort I’m giving these gloves a 19/20 and for warmth I’m giving them a 19/20. The Stormtracker did pretty well in wet conditions. Since the exterior is 94% nylon they’ll wick away water even in the most torrential rain. The palm is 100% goat leather so it’s totally fine in the water as well but not quite perfect. As you know, leather is water resistant but after a while it does start to absorb water a little bit. After it starts to absorb water it can become slightly heavy or soggy which affects the comfort slightly. With that being said they will still keep your hands dry in any sort of rain or wet snow. The battery is locked away on the front of the wrist and sealed up tight with a water tight zipper so you don’t have to worry about it getting wet as long as you remember to close the zipper. I was happy with the water resistance of these gloves so I’m giving them a 18/20. I always have the highest expectations for Outdoor Research when it comes to quality because they’re a high end brand with high end prices. Not to mention they have a very good reputation. Fortunately the Stormtracker passed with flying colors. I always inspect my gloves very carefully and look for things like defects, loose stitching or weak electrical connections and I broke out the magnifying glass for these ones. I have to say that the quality here is unparalleled. I’ve reviewed some very high end gloves before like Hestra, Heritage and VentureHeat so the bar is set very high. As I had hoped, the Stormtracker was as good as any of them so I’m giving them a 20/20. Outdoor Research worked with an established heating partner to design the ALTIHeat battery powered heat technology with a lithium-ion battery. The life of the battery is as good as any I’ve tested so far. There are three settings of heat. These are pretty good times. On top of that the charging time was only about 2.5 hours so you can really spend a lot of time outside without worrying about the cold. I’ve yet to find a pair of gloves that last longer than 2.5 hours on the highest setting so again, OR lives up to it’s reputation. In this category I’m giving these gloves a 18/20. These gloves fit true to size in my experience and that is exactly what I had found with the other OR gloves I’ve tried. I usually wear a Large and the large fit me perfectly. If you’re unsure about what size you should be you can have a look at our sizing guide and that will help you determine what to order. Well as you can see these gloves rated really well and I truly did love them. If I had to choose between these gloves and the OR Lucent I’d really have a hard time. The good news is that you really can’t go wrong with either of them. They also come with this carrying case for you convenience which I actually do use mostly just for keeping everything together so you don’t lose anything. 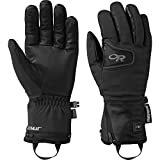 If you have the money and you really don’t want to mess around with cheap low quality gloves then you really can’t go wrong with any of the OR gloves but the Outdoor Research Stormtracker heated gloves have proven to be top notch.